Propellerhead's Reason 10 is the biggest update to the extremely popular Reason DAW – ever. 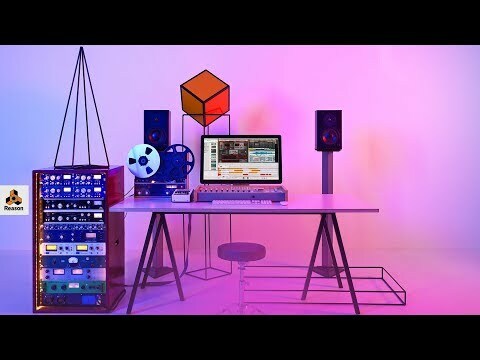 New synths, instruments, samples and more take..
Propellerhead's Reason 10 is the biggest update to the extremely popular Reason DAW – ever. New synths, instruments, samples and more take Reason 10 soaring to new heights. Taking the Reason DAW to a whole new level is Reason 10, the biggest update to Reason that has ever been released. Great new additions include Grain and Europe; massive new synthesizers. Klang Tuned Percussion, Pangea World Instruments and the Humana Vocal Ensemble are three new live-sounding organic instrument devices while the Radical Piano is a top class acoustic piano. When you buy the full version of Reason 10 between April 1st and April 30th 2019, you'll get £320 worth of best-selling plugins absolutely free. Drum Sequencer allows you to lay down some great beats. One of the most creative drum production tools available, just add this Player device to any instrument in Reason and get making great beats fast. Great for making electronic beats in Reason, Umpf Club Drums is all you need for club-ready, pumping drum tracks. Perfect if you get writer's block or just want to bring in something unexpected, the Quad Note Generator Player device brings in some fantastic and unique musical ideas to your project. With two independent sound engines, 1024 oscillators per voice, a huge range of effets and fre modulation routing, Parsec 2 is a great tool for adding futuristic sounding additive synthesis to your Reason Rack. Buy Reason 10 and register it while the offer is on and these Rack Extension instruments will be added automatically to your Propellerhead account. Act fast though as this offer ends on April 30th 2019 and you don't want to miss this fantastic offer! What’s new in Reason 10? Always evolving, the newest version of Reason 10 is the most advanced yet. In addition to all the great things you love about the Reason software, you’ll find a whole host of new features in the form of synthesizers, sampled instruments and more. Reason 10.2 arrived on September 26th 2018 as a free update to Reason 10, adding some great new functionality to the already stellar music creation software. Propellerhead have listened to what you have to say and have improved Reason 10 with several new workflow features. What's New in Reason 10.2? With Reason 10.2, you'll be able to view and edit MIDI across multiple lanes, adjust multiple faders, solo and mute in the mixer at once, snap notes to an adaptive grid based on zoom level. You will also be able to instantly use your controller with Easy MIDI Inputs, jump directly to rack devices from sequencer lanes and quickly add tracks in the sequencer or devices in the rack. Propellerhead are famous for their commitment to updating Reason and with more updates already scheduled for later in the year, Reason gives you a continually improving music making experience. Two new synths give you massive new sound and potential. First, there’s the Europa Shapeshifting Synthesizer. Designed for huge, epic sounds, Europa delivers buzzing sawtooths, shimmering, glitchy soundscapes and a whole lot in between. More than just a wavetable synth, the Europa Shapeshifting Synth gives you a wide range of modulation to apply to the waveforms along with advanced spectral filtering, harmonics processing and the ability to draw your own custom waveforms. Next, there’s the Grain Sample manipulator which gives you a smorgasbord of granular synthesis creativity at your fingertips. Drop your chosen sample into Grain and get exploring with the amazing selection of playback algorithms, the super flexible modulation, routing and effects. Its user-friendly interface is your door to a world of granular synthesis allowing you to grain up your samples and get seriously creative. Klang Tuned Percussion gives you an awesome collection of tuned percussion instruments including the glockenspiel, music box, wine glasses and a lot more. Great for creating melody lines and adding an organic layer to electronic productions. Pangea World Instruments allow you to add some real colour to your sound with a brilliant collection of instruments from around the world. From plucked and strummed to blown and pumped, there’s a whole lot of potential here. The Humana Vocal Ensemble gives you an incredible selection of choirs and solo voices. The perfect choice to add that epic edge and depth to pop tracks or bring some gravitas into a soundtrack. You can really update your sound with the new Loop Supply & Drum Supply, filled with drum samples that are perfect for modern pop, electronic and hip-hop sounds. The new Synchronus Effects Modulator allows you to really bring your music to life with its timed effects modulation. Create quick sidechain effects or even draw your own LFO curves to control delay, reverb, filter, distortion and level. A brilliant way to evolve your sound. Giving you an advanced acoustic piano sound is the Radical Piano - a simple idea but with amazing results. Sampling technology and physical modelling algorithms combine to give you the amazing, versatile and flexible sound of three pianos. Fantastic for songwriters, producers and sound designers, the Radical Piano gives you a never-before-seen level of control over your piano sound. In addition to the new synths, some old favourites return. The Thor Polysonic Synthesizer, the Malstrom Graintable Synthesizer and the Subtractor Analog Synthesizer give you some really distinct flavours with powerful sounds and comprehensive parameter control to create some great sounds. Sometimes beats aren’t just for creating the rhythm to your music, in fact – for many artists, the beats are the music. To cater to all your beat needs, Reason 10 provides you with the Kong Drum Designer, the Redrum Drum Computer and the Dr. Octo Rex Loop player so you’re ready for anything your creativity demands. Reason 10’s Player devices are a fantastic source of inspiration. Scales & Chords, Dual Arpeggio and Note Echo provide scale-awareness, chord memory, arpeggios and more to your other Reason 10 instruments. While the new sampled instruments are fantastic, Reason 10 just wouldn’t be the Reason DAW we know love without the return of some greats. The NN-XT Advanced Sampler, the NN-19 Sampler and the ID-8 Instrument Device all add that physical element of recorded samples, breathing life into your music while giving you a huge range of controls so you can customise and shape your sound. Reason 10 makes use of Rack Extension technology so your Reason rack is open to a world of instruments created by third party developers in addition to the great Rack extensions from Propellerhead themselves. Get your physical instrument involved too! Reason’s External MIDI Instrument allows you to connect your MIDI synths, beatboxes and more with full automation. The Reason rack is extremely flexible and allows you to shape it around your needs. With the Combinator for example, you can mix layer and combine instruments and effects, creating rich and production-ready sounds. The RPG-8 is a classic monophonic arpeggiator that creates arpeggiated melody lines based off the chords you’re playing for instant, fleshed out performance. Your virtual rack is at the heart of Reason. You can fill your rack with as many devices as you want in order to achieve the sound you’re looking for. Everything is automatically routed for you as you build your rack so it’s extremely easy to add in new instruments and effects. Take it even further by turning the Reason rack around and you can play around with the cables! Get the exact sound you require by routing the audio yourself and controlling the voltage between devices in the rack. Record and edit audio, MIDI and automation with Reason 10’s powerful recording and editing tools. Quantize MIDI or audio to quickly fix timing issues or use ReGroove to add a little swing to your sequences. You can record how you want to later and decide on the tempo later by using Reason’s popular time stretch feature. You can even transpose the audio if you’d like to change keys after recording! With pitch edit you can really fine-tune your vocal performances to get seriously professional results and get everything timed perfectly with Slice Edit. Polish off your songs with Reason’s mixer and get that incredible big studio sound on your own computer. Faithfully modelled on the legendary SSL 9000K*analog mixing desk, the Reason Mixer provides you the same full dynamics, EQ, automation, flexible routing, groups and parallel channels and its renowned master-us compression. With Reason software, you are taken through the entire musical journey. From inspiring tools that aid your composition to the plethora of effects and sound shaping options that allow for powerful production and its recording, sequencing and mixing capabilities completing the journey. Buy Reason 10 now to get the full, most recent version of this incredible music software.